Hakusan, Japan, July 26, 2013 – EIZO Corporation (TSE: 6737) today announced the FlexScan S1503, a 15-inch square monitor with a 1024 x 768 native resolution. 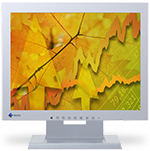 The release of the FlexScan S1503 ensures EIZO will continue to offer a stable supply of 15-inch monitors for customers that need to retrofit their legacy systems. The FlexScan S1503 uses an energy-saving LED backlight and comes with EIZO’s five-year manufacturer’s warranty*. It offers excellent visibility with maximum 400 cd/m2 brightness and an ambient brightness sensor that automatically adjusts the screen to the ideal brightness level under any ambient lightning condition. Several preset modes including sRGB, Text, and Custom (user-defined settings) are included for viewing comfort. A modulated light adjustment function prevents flicker at low brightness settings to reduce eye fatigue. The FlexScan S1503 is now shipping. Date of availability varies so please contact the EIZO subsidiary or distributor in your country for details.